The Shimano 105 PD5800 Carbon SPD-SL Pedals, have been designed to complement the 105 5800 11-speed group. As you would expect from Shimano these peddles are made for high performance cycling, racing, club riding or improving on your personal best; these pedals are all about performance. The lightweight carbon composite body ensures a large shoe contact area maximising power transfer. Exactly what I have come to expect from Shimano. My 105 pedals were a great addition to my new build. Decently lightweight, flawlessly functional, and maybe most important... killer looks. Good quality pedals. No need to pay more in my view. 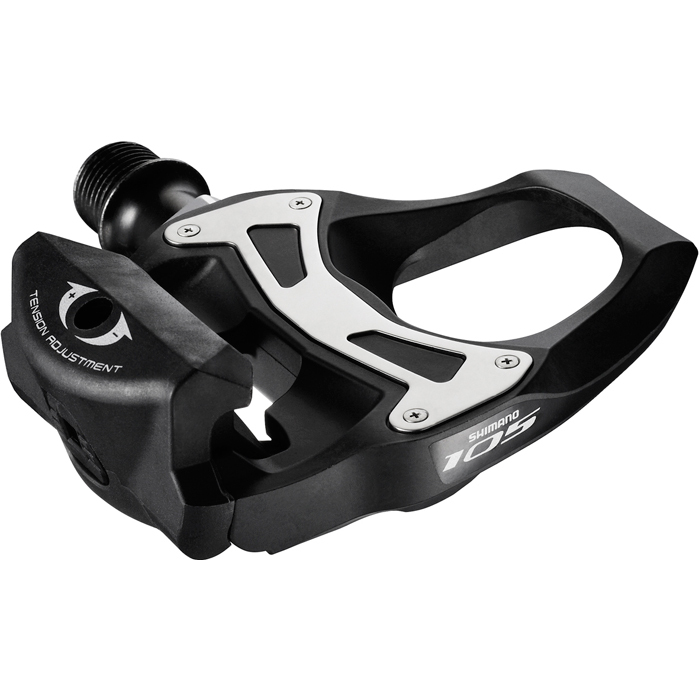 Bought these pedals to go with 105 groupset, lightweight, clipping in/out with ease, good pedals. I had considered newer version but weight difference did not justify extra cost. So far so good. First ride after changing the pedals. Good balance and smooth. Beautifully made and expect to get many years of wear out of this pair. Comes with yellow cleats. Easy to click in and out of, with a nice wide platform for stability. Excellent pedal, lightweight, inexpensive and durable. I absolutely love these pedals, they are light, stiff, and have a very secure hold on my cleats. I bought these to replace spd pedals on my road bike and immediately noticed the difference in efficiency. If you have money, you can buy ultegra or dura ace but by high percentage you dont need them if you have shimano 105 5800 pedals. Working as butter in all cadance and resistance range (low cadance like under 60 - high resistance, high cadance -low or high resistance). Thank you for quality product merlincycles.com. Great value upgrade from my previous 105 SPD's which I have now transferred to my winter bike. These are lighter and more supportive. Aesthetically, they match better with my 105 groupset. They perform well and secure the cleats on the minimum tension setting. Well engineered. Why pay more?? My first SPD-SL pedals. Very solid high-quality feel. On the loosest setting they are easy to clip in and out, which is perfect for a beginner like me. Very light, and the design is actually nicer than pictured; there's a little glimmer on the sides. I like the smooth bearings and wide contact surface. Best pedals ever? I think for the price and weight Yes. Mine came in lighter than the advertised 285g at 274g. That's Ultegra weight! In use they are excellent, positive click in, and a wide platform, also used the R550 and these in comparison are worth the extra money. Have a set on my other Roadie - light, solid and smooth - what's not to like? Really light and stiff for it's price, very slick design. I can't really review these compared to other rd pedals as I have always just used my mtb pedals. I can say that I wish I bought them a long time ago. Much better support and efficiency. I have them set as loose as they will go and they are still a little hard to unclip. I am assuming they will loosen up over time. Decided to upgrade from the R550 on my tri bike; noticed the difference in the first few pedal strokes. Not as much carbon as I thought but won`t complain for the price. Work just as well ultegra but at a super affordable price! Took a bit of getting used to clipping in, even after owning my pair of old PD-7800 for a couple years. It's probably due to the wider design, which I like. The wear plate doesn't seem as durable as I expected, but that might be a problem with my float and not the plate design as the plastic plate on my previous pair wore out faster than a fat man running on a treadmill. Pedals are plenty light enough, not sure why you would spend 3X the price on the dura ace or ultegra for negligble weight savings. I also think the 105 is a better value than the very similar R550 as you are getting a lighter pedal and better sealed bearings (and a bit more bling) for not that much more money. As usual, shimano quality meaning a great product - find them easier to clip in to over the alloy equivalent, excellent! These pedals are lighter and with a wider platform than my previous Shimano 105 pedals. I love them. These pedals are simplistic and fantastic. I have already ridden them for 200 miles and they are stable, stiff, and give just the right amount that you would expect from Shimano. These are my first carbon pedals I have owned and I can honestly say I'm hooked!! I would recommend these especially to anyone like me who has minor knee issues and could not stand tiny pedals that force all of your weight down onto one tiny spot on the pedal. Also the degree of freedom the cleats themselves have is just the right amount to stay relaxed and keep your legs mobile on a long ride. Having recently built a bike with the Shimano 5800 11-speed group I decided to go all in an get these pedals to replace a pair of SPD ones. I have another aluminum SPD-SL set of pedals so it was no problem to make the switch. What is nice is the carbon pedal body. Makes clicking in feel much more natural and very secure. I cranked the adjustable tension about 1/2-way in and have been solid and creak-free for the past 2 months. Great pedal for value. Having recently upgraded my gears etc from Tiagra to 105 I decided to do the same with my basic spd's that I have been using for the last few years. Very pleased with these, lighter, better bearings and a wider footbed which somehow feels more comfortable. Easier to clip in and with less slippage as the pedals seem to 'hang' better. Definitely recommended. I already have the Ultegra for my other bike , couldn't see a reason to spend the extra money again , these look virtually the same and there is only a tiny weight difference. Job done . Another great product from Shimano , more great service from Merlin as usual. These pedals are ridiculously light and a great value! Best pedals I've ever used! Could not be more pleased with these new 105 pedals! They're a significant step up from my old alloy SPDs and pair well with carbon-soled shoes for power transfer. Highly recommended as a mid-level upgrade! Easy to get in and out of the pedals. Look great and are very light. Such great service and quick like always. Excellent. Wondered about spending extra on Ultegra pedals but glad I stuck with the 105. Smooth, light and much more comfortable than my old SPDs (feel more efficient too). Great value for the money. I purchased these as an upgrade from the standard Shimano SPD-SL and I can clearly see the difference. It is easier to get foot in at junctions as they seem wider. For the same reason it seems you can put more power into the pedals too.